NADA Appraisal Suite turns the entire appraisal process into something your customers can truly understand. Use this simple online tool to close more deals without the back and forth. Use NADA Appraisal Suite to take customers through the appraisal process with you, showing them everything that goes into your number. Then, show them it’s backed by NADA Values, with an official appraisal document. I am interested in a product demo. Produce an overview of your appraisal, branded with the NADA Valuation Services logo. When customers know what’s behind your number, they know it’s time to sign. Integrate your Experian AutoCheck® and CARFAX® vehicle history reports free and seamlessly, for a more complete picture of the vehicle you’re appraising. With NADA AppraisalPRO, access NADA values along with data from top sources: AutoTrader.com®, J.D. Power PIN (Power Information Network), Manheim Market Report and vAuto. What’s the back and forth costing you? Between first pencil and final signature, there can be a lot of back and forth. 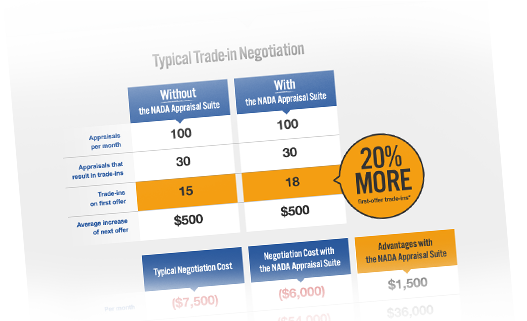 Find out just how much it’s costing you — and how much you’ll gain with the NADA Appraisal Suite. Choose the NADA Appraisal Suite tool that fits your needs. NADA Used Car Guide® and its logo are registered trademarks of National Automobile Dealers Association, used under license by J.D. Power.